Map showing location of Golden Springs . Use the controls on the map to zoom in and out. This place is a bad advertisement for an Kiwi Holiday Park. We had some Canadians staying next to us and they were concerned that all Holiday Parks in NZ were as bad as Golden Springs. The place is untidy and mostly unkept. Our room had leaking guttering over the entrance, maintenance required everywhere you look. I don't say this easily but the place is a dump. Some of the caravan and tent sites looked ok. I would never recommend Golden Springs and the review average score they have from the online booking site I used to book must be rigged. In order to run a Holiday Park you have to pay attention to the grounds and buildings, not sit behind a computer. Good enough location and facilities. Cabins have character as they are older but certainly clean and well maintained. Also have campsite . No complaints and recommended for a relaxed and friendly stay. My family and I stayed about 20 minutes, just long enough to have a shower and see the uncleanliness of the facilities. the buildings looked in disrepair and the fence surrounding the pool was falling apart. I would not recommend any one to stay here, a massive disappointment. 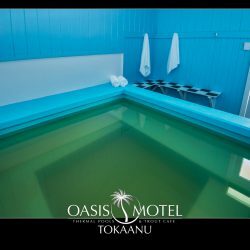 Hi, I am the proprietor of Golden Springs Holiday Park (since Jan 2008) and this natural thermal stream is available to all our guests staying in our camping and accommodation facility. The Holiday Park was established in before the 1940â€™s and the buildings are on the older side. However, they are well maintained and are cleaned daily. There are hot showers and clean toilets which are all registered and passed as part of the camping facility by the Rotorua District Council. We are inspected from time to time each year, and have not had any complaints from the council to date, and intend to continue to keep it that way. We appreciate your constructive views and comments and respond to these where improvements are necessary. Terrible washing facilities for camping toilet old and dirty. Left after 10 minutes and owners refused to give refund. Not recommended. Great little pool and we were the only ones using it at the time. The motel accommodation wasn't super flash but it was clean and serviceable. The hot pool made all the difference to our stay. This is an awesome little spot. We stayed there over Easter 08 and enjoyed the hot bubble pool in the morning with coffee and in the evening with a wine. To get to it you go along a little winding path with beautiful bush and bamboo, the pool isnt huge ~ maybe fit up to 8 or so comfortably. The bottom is pebbles so really nice underfoot and it is fed by a really pretty smooth waterfall. I loved it and would go back just to enjoy the hot spring!